Learn from Joy. You can learn a lot from joy and from success. In your life you have probably seen many movies and read many books about people who have learned through adversity. However you rarely see any movies and read many books about people who have learned through success. While the success story is more boring to watch, that doesn’t mean that there isn’t anything to gained from learning from joy. Learning from joy, from success, from what you want is a great way to keep on getting more of what you want, more joy, and more success. Don’t you want more success? Of course you do. Be sure to learn from your successes, so you can keep on making them successful! In fact, learning from what works generally works better than learning from what doesn’t, because you can build on what works. What doesn’t work, does help, however it generally brings you back to the drawing board. Learning from success allows you to keep the drawing board and add more or refine. Learn from success and from not success and your life will be amazing. Internationally certified life coach through inviteCHANGE, Brett Dupree envisions a powerful future in which people live in pure joy. He believes that there is a great transformation just around the corner and he coaches people on how to use passion and inspiration to ride the powerful wave of awakening that is sweeping this world. Brett has dedicated his life to the study of personal empowerment. He believes that real lasting change comes from changing from the inside out. Working with you one-on-one, Brett helps you listen to your inner voice to reach your goals with passion, inspiration and ease . He creates a sacred space that allows you clients to bask in the joy of creation. He will help you find peace and balance in their lives so you can transform yourself into a self leader. Using the power of intentions, the Law of Attraction and his deep loving powerful heart he helps his clients gain miraculous results. Internationally certified life coach through inviteCHANGE, Brett Dupree envisions a powerful future in which people live in pure joy. 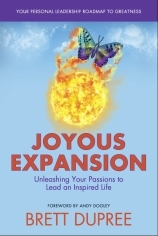 He believes that there is a great transformation just around the corner and he coaches people on how to use passion and inspiration to ride the powerful wave of awakening that is sweeping this world. Brett has dedicated his life to the study of personal empowerment. He believes that real lasting change comes from changing from the inside out. Working with you one-on-one, Brett helps you listen to your inner voice to reach your goals with passion, inspiration and ease . He creates a sacred space that allows you clients to bask in the joy of creation. He will help you find peace and balance in their lives so you can transform yourself into a self leader. Using the power of intentions, the Law of Attraction and his deep loving powerful heart he helps his clients gain miraculous results. As a writer, editor and content development coach for nonfiction authors, getting to the “meat” of a story or message is crucial. Even in a how to book, there needs to be something that draws the reader in, makes them want to care, and helps them see themselves in the writing. For better or worse, it is the problems that create the drama that hook us in. The joy tends to be the resolution – the thing we are seeking instead of the part that starts the process. Throughout history, the classic stories that are handed down are the ones of conflict, and they may or may not end in resolution or joy. I agree with you – that joy and success are equal teachers and wonderful tools in the process. But do we truly appreciate their lessons without the struggle of getting there? Or is it the juxtaposing of the struggle with the joy that we internalize and really learn from? I love the conversation you’ve started! Keep up the great work!